Her name is Sally. She lives on the streets, struggling every day just to survive. A teen named Tom refuses to simply pass her by, and instead stops and befriends her. “It's the unexpected friendship between a teenage boy and a homeless woman named Sally,” said Findlay Creek author Chris Nihmey. “I wanted to write a story about the connection between mental illness and homelessness. Nihmey said in telling Sally's story on the pages of his newest published book, Sally, he wanted to give his readers a chance to connect with those living that life, to better understand them as people behind the 'homeless' and 'mentally ill' labels. In Sally, Nihmey introduces Sally to children and teens through the eyes of Tom, a teenager himself. Though it is a fictional work, the story is based on Nihmey's experiences volunteering in downtown Ottawa at the Ottawa Mission and Shepherds of Good Hope, where he helped serve food and played piano between 2000 and 2005. It was in 2005, when Nihmey was in the depths of his own mental-health struggles, that he began writing Sally to open the eyes of young people to the importance of reaching out to others who are isolated, vulnerable and struggling on the streets. Nihmey credits his parents, especially his mom, Rosemary, who passed away in 2014, with instilling in him deep compassion for and acceptance of people no matter their circumstances. He was just eight years old when his mom started a Christmas dinner that drew 100 people in need. Over a 20-year period, attendance climbed to about 400 people annually. The event evolved into the family delivering meals to those in need, an experience that would leave a lasting impression on Nihmey. It's that level of caring and compassion that can make a difference in the lives of others. “I wanted to show people through this book that mental illness destroys lives and if we're not there for each other, people do die. And this needs to change,” said Nihmey, who today is an author, substitute teacher, mental-health advocate and regularly gives presentations on mental health to schools and organizations. Without his parents' support, he said he would have ended up living as a person of no fixed address, given the extreme highs and lows he was tormented by. He had already been spending a lot of time on the streets, wanting to connect with the homeless. It would be another two years before Nihmey would begin writing Two Sides to the Story: Living a Lie, chronicling his own struggles with mental illness. He was eventually diagnosed with bipolar disorder, and later obsessive compulsive disorder and generalized anxiety disorder. When his memoir was published in 2013 by Chipmunka, a mental-health publisher, Sally was included at the end of the book. But Nihmey, who had already written and published two children's books before Two Sides, always envisioned seeing Sally published on its own as an illustrated picture book for children and teens, as well as for adults. 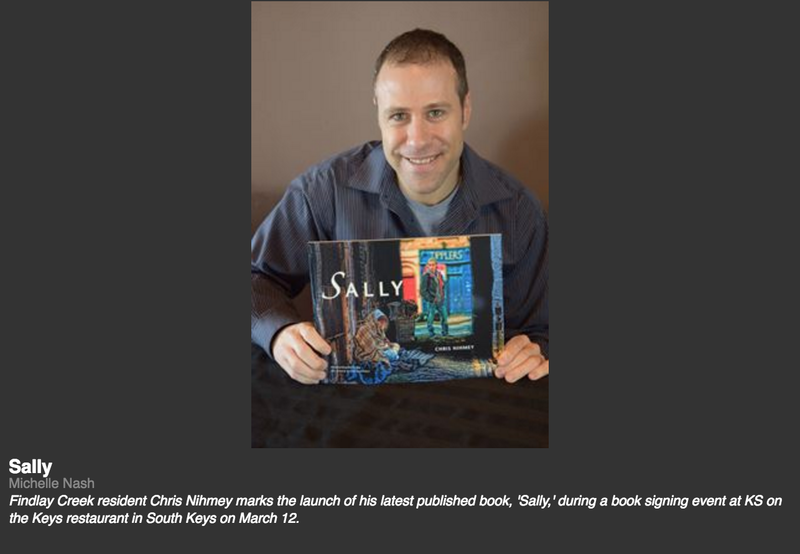 The 60-page paperback was released last fall by Chipmunka, and Nihmey has marked its launched with a number of book signings, most recently on March 12 at the KS on the Keys restaurant in South Keys. The published work is chock full of colourful illustrations in the style of photo-realism. Each are brimming with movement and emotion, thanks to the artistic talents of Florida illustrator Mario Jamora. Like the story, each illustration provides a much-needed window into the friendship that blossoms between Tom and Sally. And Nihmey hopes people of all ages will learn something from Sally. “Many kids will not have the parents I did who made it their goal to show me a world that needs love and compassion,” he said. Nihmey's latest work is available at indigo.ca and amazon.ca. For details, visit chrisnihmey.com. In the same vein as Sally work, Nihmey is also planning to write a book about his foster brother's life, which will also be illustrated and written for all ages. He has also completed a 200-page anthology of short stories, biographies and poetry submitted by residents from Royal Ottawa Place, a long-term care centre. The work, called United Together: Reflections of Our Lives, will likely be published within the next year. Erin McCracken is a reporter/photographer with Metroland Media’s Ottawa South News. She can be reached at erin.mccracken@metroland.com<mailto:erin.mccracken@metroland.com>. Follow her on Twitter and Facebook.